Background: Hydrogen sensors are micro/nano-structure that are used to locate hydrogen leaks. They are considered to have fast response/recovery time and long lifetime as compared to conventional gas sensors. 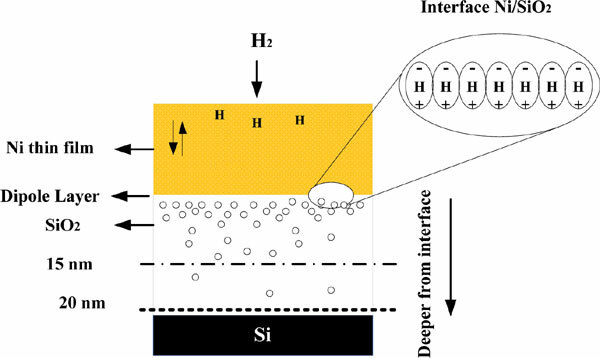 In this paper, fabrication of sensitive capacitive-type hydrogen gas sensor based on Ni thin film has been investigated. The C-V curves of the sensor in different hydrogen concentrations have been reported. Method: Dry oxidation was done in thermal chemical vapor deposition furnace (TCVD). For oxidation time of 5 min, the oxide thickness was 15 nm and for oxidation time 10 min, it was 20 nm. The Ni thin film as a catalytic metal was deposited on the oxide film using electron gun deposition. Two MOS sensors were compared with different oxide film thickness and different hydrogen concentrations. Results: The highest response of the two MOS sensors with 15 nm and 20 nm oxide film thickness in 4% hydrogen concentration was 87.5% and 65.4% respectively. The fast response times for MOS sensors with 15 nm and 20 nm oxide film thickness in 4% hydrogen concentration was 8 s and 21 s, respectively. Conclusion: By increasing the hydrogen concentration from 1% to 4%, the response time for MOS sensor (20nm oxide thickness), was decreased from 28s to 21s. The recovery time was inversely increased from 237s to 360s. The experimental results showed that the MOS sensor based on Ni thin film had a quick response and a high sensitivity. Keywords: Thin film, capacitive, oxide thickness, recovery, sensor, concentration. Keywords:Thin film, capacitive, oxide thickness, recovery, sensor, concentration. Abstract:Background: Hydrogen sensors are micro/nano-structure that are used to locate hydrogen leaks. They are considered to have fast response/recovery time and long lifetime as compared to conventional gas sensors. In this paper, fabrication of sensitive capacitive-type hydrogen gas sensor based on Ni thin film has been investigated. The C-V curves of the sensor in different hydrogen concentrations have been reported.